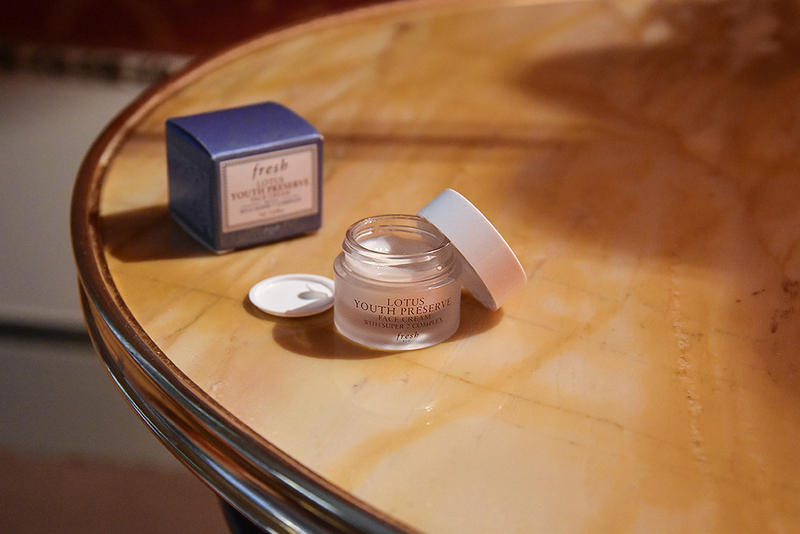 Today I want to share with you guys my thoughts on this Fresh Lotus Youth Preserve Face Cream with super 7 Complex. It is a lightweight daily moisturizer that, according to the label, prevents visible signs of aging, provides 24 hours of significant moisture, and boosts radiance. I got a deluxe sample of this Fresh moisturizer and had been using for a few weeks now. it's a lightweight moisturizer that absorbs very quickly, makes my skin smooth and hydrated and doesn't breack me out. It doesn't feel greasy on the skin and works perfect under liquid foundation. What else I would ask? . Well, I don't see it was boosting radiance or keeping my skin moisturized for 24 hours, just like the label claims. Another thing I can't stand about this Fresh moisturizer (like any other Fresh skincare products) is it's scent. Overall, this Fresh Lotus Youth Preserve Face Cream with super 7 Complex is a nice, lightweight, quick-absorbing moisturizer, but I would say__ it's still kinda 'basic' moisturiser nothing special that will make me purchase it. It might be better for normal skin but for my dry skin I need a better performing moisturizer , especially in upcoming cold seasons. Have you tried this moisturiser yet? Let me know in the comment section below. is the scent that bad? looks like its a normal moisturiser, sad it doesn't wow you. It's not very strong smell and it goes away after some time, but I, personally, don't like cucumber scent, Pam. Thanks for your honest review! I need something that packs more punch for the upcoming cooler months too. I totally understand you Kathrine, me too, I need richer moisturizer than this one. Too bad it didn't wow you. When you're splurging on skincare you definitely want to be blown away. I haven't tried this one before, but I love the Fresh face masks! I haven't tried face masks , I'm glad you like them Elisabeth. I like some of Fresh products mainly from the Black Tea range but they are so pricey. These days I tend to stay with Asian beauty products which new kinder to my wallet. I haven't tried anything from Black Tea range, I woder if they have same Fresh signature scent..
Definitely have to try this moisturizer! Thanks for sharing! I wish I could try this product one day, looks like it should work very well! sounds great! I must to try it. Thank you for the review. This was a moisturizer I was very interested in. I will check it on the counter first now. Thanks for sharing your honest thoughts with us on this face cream, I've never heard of it before, so it's good to know a bit about it in case I come across it. I hope you're having a great start to your week so far! Hey Nina, too bad the product didn't live up to your expectations. Thanks for this honest review and have a great new week. I think it will work best for someone with oily skin or combination skin. I used to buy all the novelties you can imagine, expensive creams that were launched every month. I wore them once or twice and never anymore. So now I prefer lightweight basic mositurizers, and this one seems to be good, though not for you. I would like to give it a try... let's see :) Hope you have a lovely day! It looks so good, I need to try it ! This looks so good and I'd love to try it! What an amazing review. Now I want to try Fresh Lotus as well. Sad the moisturizer didnt work for you... thx for a honest review dear..
Great review. I have not tried this one. Sounds really good, I like light moisturizer too as it won't clog pores for sure. Thank you for sharing this review, it looks like it must work well! sounds really great! I wish to try it. I love Fresh products! They always smell so yummy!